The iron & TIBC test measures the total iron, TIBC and iron saturation blood levels. What is the iron & TIBC panel test? The iron & TIBC blood test measures the total iron, total iron binding capacity (TIBC) and iron saturation percentage blood levels. Why is the iron & TIBC lab test important? The iron & TIBC blood test is important as it helps assess iron and iron saturation in the body. This Iron & TIBC Test Panel is a blood test. The iron & TIBC test panel, also known as a TIBC blood test, measures the iron and TIBC blood levels and calculates the iron saturation percentage. The iron & TIBC test panel builds on the total iron test by measuring the total iron-binding capacity (TIBC) and calculating the iron saturation level. TIBC, also known as transferrin iron-binding capacity, evaluates how well iron in the body binds transferrin, a major iron transport protein in the blood. The iron/TIBC ratio, or iron saturation, is calculated to determine how well the body binds iron and transports it. In iron deficiency anemia, the serum iron is typically low, the TIBC is high, and the iron saturation is low. The iron & TIBC test panel is helpful in evaluating different types of anemia such as iron deficiency anemia. To get an iron & TIBC test near you at a Quest Diagnostics lab, order online and get your blood drawn at the selected lab location. Once the iron & TIBC lab report is ready, it will be available for download. As can be seen on the sample iron & TIBC lab results, the iron total and iron binding capacity levels are reported as numerical values. The iron saturation is then calculated from these levels. Fasting is recommend before getting an iron & TIBC test panel. For a more comprehensive look at the body iron status, the iron, TIBC & ferritin panel or the iron blood test panel are good choices. 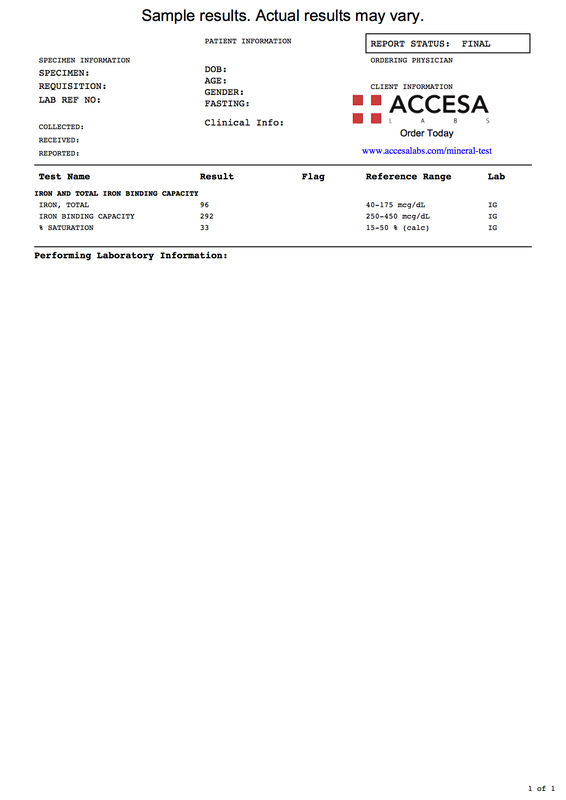 This iron & TIBC blood test is a component of the mineral blood test panel. Iron & TIBC Test Panel at Guaranteed Prices.